When renovating our motor home, an older Fleetwood Bounder, we were really stumped when it came to how to replace the carpet in an rv - when buying new carpet was out of the question. We knew it needed the ultimate rug cleaning or to be replaced. But this didn't fit in our frugal lifestyle and lack of funding, even if we wanted to replace it with new. So buying new carpet wasn't a consideration. Paying someone to deep clean the living room and bedroom carpets, only to have them get filthy again, seemed like an economical drain. Hate RV Carpet Cleaning? No More Rug Shampoo For You! We were certain we had lost our little frugal minds when we decided that the only solution for us was to take a chance and pull up the old, filthy carpet in the motor home we had just purchased. Trying to look at the bright side before biting the bullet, we celebrated the fact that we would no longer have to worry about rv carpet cleaning and shampooing. It would be a more sanitary solution - so the decision was made....out you go, icky carpeting! Don't get us wrong...we were afraid of the "cons" in this decision. Like anyone else, we enjoy the bounce of plush carpeting under our feet. We loved it, in our previous sticks and bricks home, where the long entry hall did a good enough job, with throw rugs to assist the continuous foot traffic, at keeping the household carpeting clean. But that isn't the case rving. Nope...in the great outdoors, rain plus dirt equals mud. Mud sticks to shoes (along with pine needles and other debris), then you track it in and out all day long. In addition, our dog has 4 paws...so on a rainy day, that equates to 8 feet tracking dirt all around the camper (4 human feet, 4 doggie feet). So we decided to think outside of the box...the dirty carpet wasn't the actual problem...having carpeting was what caused us so much grief! Even if we had the money to lay new carpeting, we knew we wouldn't have done it. Why? Because new carpeting causes ridiculous amounts of stress! 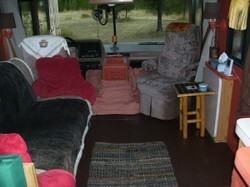 We are supposed to be enjoying simple living in this frugal rv lifestyle. But does this sound like living simply? Putting boots on your poor canine or leaving her out in the rain? Constantly worrying about a spill or stain? 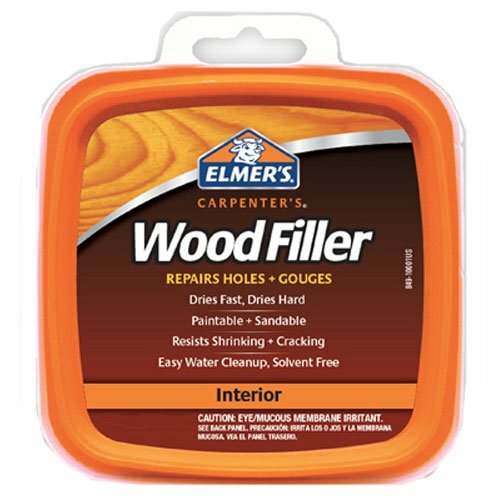 Endlessly cleaning your rv carpet because of the wear and tear it goes through? We have a rule or motto to our cheap rv living...it goes a little something like this..."no, you CAN'T have it all!" Perhaps luxurious, clean rugs in a camper are like oil and water...they just don't mix. Now if you want to constantly worry and fret (and bathe your dog) at every drop of rain...well, then that would be an exception. But we want to walk in and out of our motorhome without fear of more work, more cleaning, more money to invest in shampooing rugs. In the end, this turned out to be one of our favorite cheap rv makeover ideas when we renovated this motorhome on a budget. If you'd like, check out our section in this article about all of our other rv remodeling ideas...all frugal! Yep, We Painted The RV Stairs, Too! So How To Replace RV Carpet With Paint, You Ask? The most difficult part of removing rv carpeting is pulling out the tons of staples. Yes, you need to do this first. The rest was extremely simple to do. Our plywood underneath did not need sanding, but we did fill some holes and cracks with wood filler. We put a heavy coat of Kilz oil-based primer down first. 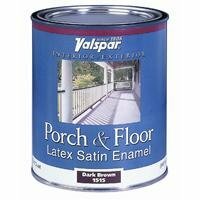 Then put two coats of porch and floor paint on top. You can top with a coat of polyurethane, which we are going to do next summer. We wanted to try it without, and scuff/chips are very minimal, but we think we'd would prefer the added protection in the future. The final touch of home is to put a throw rug on top (or you can even buy a large dorm room size carpet and lay it down if you want more coverage...it is affordable and easily replaced) and it feels like home! We really love it. Cleaned in seconds with a little dirt devil and swiffer mop...now that is simple living to us! frugalrvers, What is the flooring in the bathroom and kitchen like? Throw rugs are a blessing in a house or rv, aren't they!? I love the idea of painting in place of carpet! I hate carpeting anywhere in my home. Throw rugs can either be washed or replaced, but carpeting gets gross and you're stuck with it. Great pictures!